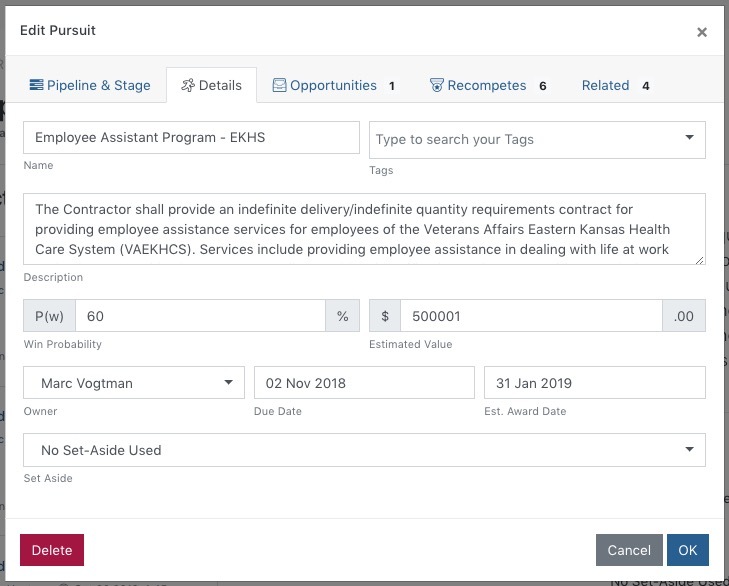 Pipelines on GovTribe contain Pursuits, and each Pursuit represents an individual contract or grant opportunity at some stage of the review, response, or bid process. Pursuits can be created from or linked to one or more Opportunities or Awards that you find on GovTribe. They can also be created manually from the Pipeline page, and not linked to any existing information in GovTribe's database. Regardless of how the Pursuit is created, the features within each Pursuit are collaborative and powerful. In this article, I am going to walk through all of the elements of the Pursuit. Here is a video tutorial that provides walkthrough of a Pursuit. Below that is a written walkthrough with screenshots. The first things you see when you click on and enter a Pursuit page are the Header and the Details section. The header of the Pursuit contains the name or title, as well as some key metadata - the last updated date, the Pursuit owner, and the Pipeline and stage in which the Pursuit currently resides. The Details section of a Pursuit contains the rest of the information that the creator of the Pursuit enters at the time of creation. Some of this information will auto-populate based on information from a linked Opportunity or Award (i.e. the title, the description, the due date), but it can all be edited at creation - or at any time by clicking on the Edit button in the upper right corner of the page. Clicking the Edit button launches a pop-up modal that allows you to modify any of the information in the Details section, as well as the Pursuit title, the Pipeline and stage, and the owner of the Pursuit. For more on this, check out our help article about Reporting on Pipeline Performance. On the left side of the page is the Activity Feed. 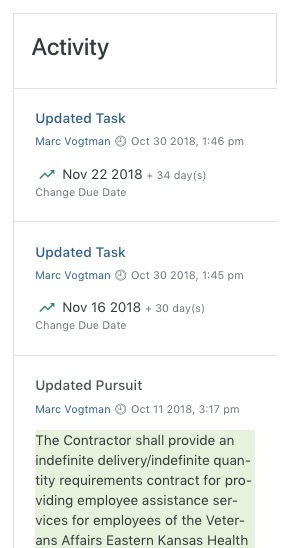 This shows you a real time feed of all changes and updates to the Pursuit. It includes both updates made by you and your team, as well as any changes posted by the government to any linked Opportunities or Awards. Each activity message is date and time stamped, and all activity generates an instant email notification that goes out to all members on the account. Below the Details section of the Pursuit is a tabbed, interactive portion of the page. The first, default, tab is Discussions. 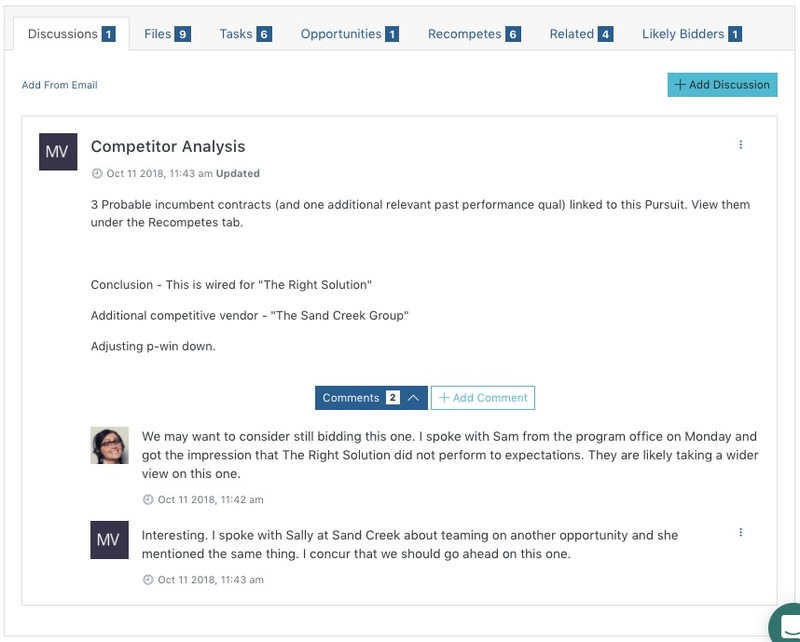 Discussions is a threaded comment board unique to each Pursuit page. Any account member can start a new discussion by clicking the Add Discussion button in the upper right corner of the box. Each Discussion has a title and a space for long-form descriptive text. 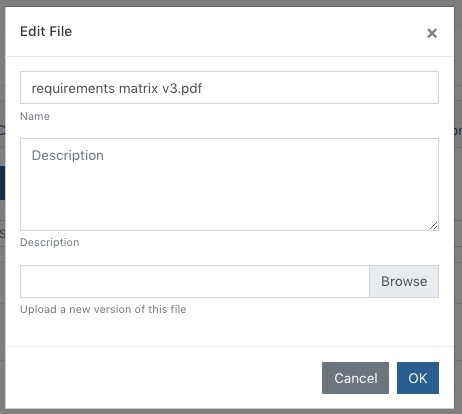 You can also add files to a Discussion, allowing you to contextually annotate any file attachments you need to add to the Pursuit. Once a Discussion has been created, there is an Add Comment button below it. That allows you to add a comment underneath the discussion to respond to, or participate in, the Discussion. If you send an email to a Pursuit's email address, the subject and body of the email will be added as a new Discussion. Any files attached to the email will also be attached to the Discussion. The Files tab contains all file attachments associated with your Pursuit. Within the Files section, there are two sub-tabs - Pursuit and Government - and you can toggle between them. The Government files are those that are added for you automatically when you have your Pursuit linked to an Opportunity. Government files are kept up to date automatically. 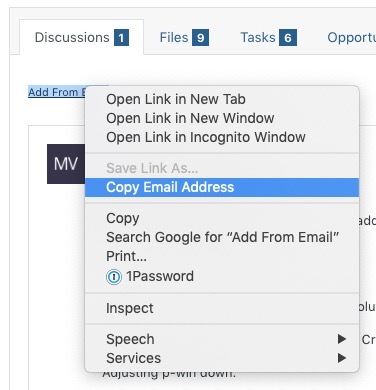 As the government posts new files to any linked Opportunities, GovTribe pulls them into your Pursuit page. The Activity Feed is updated, and the files appear here. The Pursuit files are those that you or your team manually add to the Pursuit. These are usually draft proposal documents, past performance quals, completed quote sheets, resumes, etc. Anything that relates to your bid package. To add files, click the + button in the upper right corner of the Files box (while viewing Pursuit files). A pop-up will appear that allows you to add files from your computer. GovTribe helps you to manage versioning of all of your Pursuit files. To add a new version of a file, use the Edit button next to any of your files. The pop-up modal that appears has a section that allows you to Upload a new version of this file. Once you do so, you'll notice a small arrow for a drop down menu next to the View button for that file. From there, you can view and download all previous versions of the document. Integrated with every Pursuit is a Task management capability. Tasks can be created within any Pursuit, assigned to a team member, and tracked against due dates. From the Tasks tab, you can create tasks using the + button. You can also view all of the Pursuit Tasks and their status. To learn more about Task management, you can review our help article on that topic. 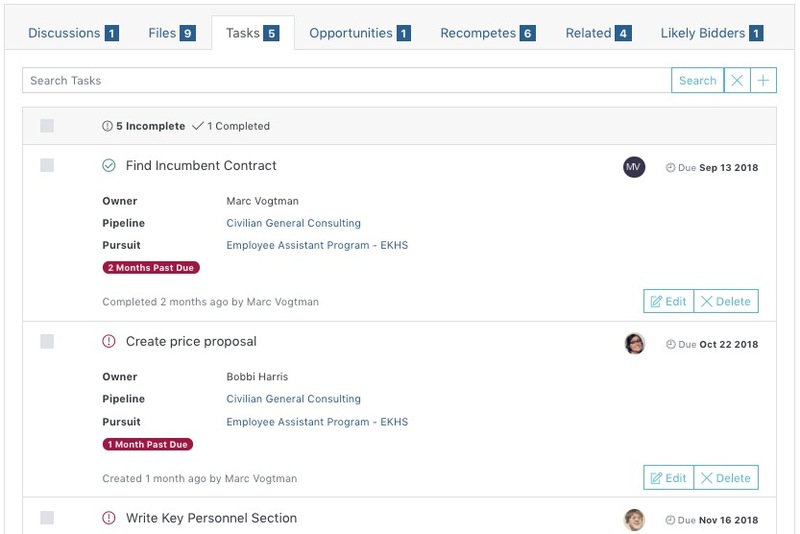 The Opportunities tab shows a list of the Contract and/or Grant Opportunities that are linked to the Pursuit. 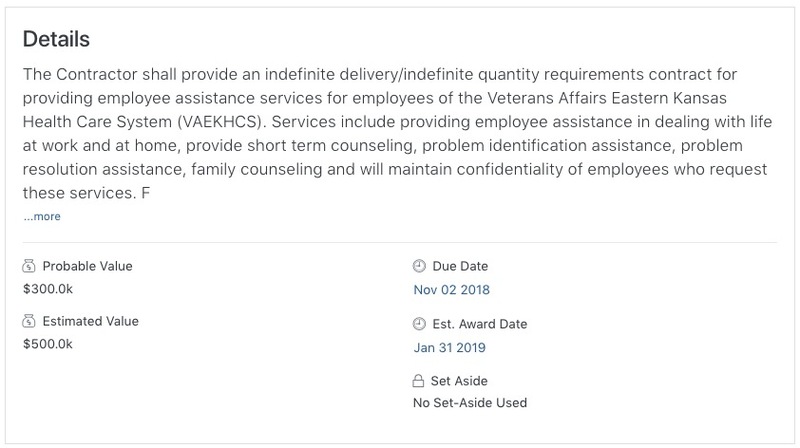 So if the Pursuit was created by clicking the Pursuit button from a Federal Contract Opportunity page, for example, the link back to that page will appear here. 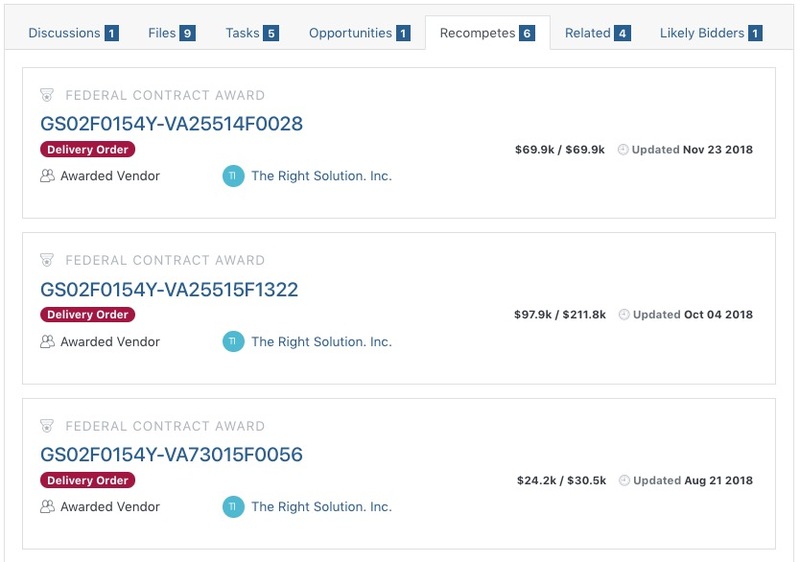 The Recompetes tab shows a list of the Contract Awards or IDVs (or Grant Awards) that are linked to the Pursuit. So if the Pursuit was created from an Award or IDV, the link back to that original Award or IDV page would be listed here. 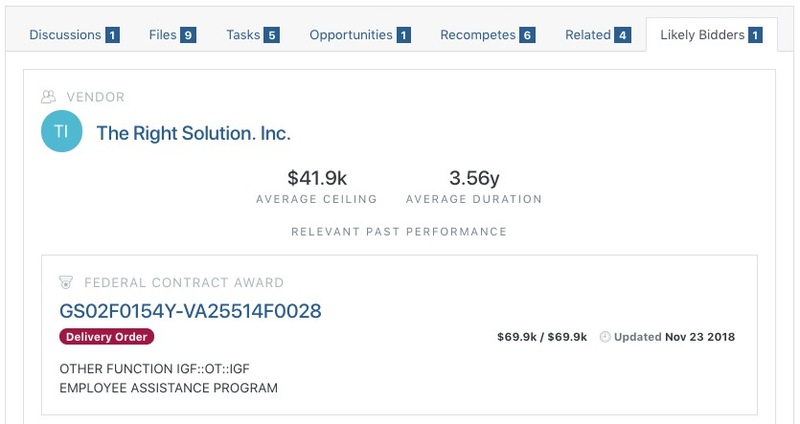 Similarly, if you do research on incumbent contracts for a new opportunity and link those Award or IDV records to an existing Pursuit, the links back to those pages would appear here. The Related tab shows you links to all other associated parties and categories related to the Pursuit. Most commonly, this is where you will find the federal agency, the government point of contact, the NAICS code, and the PSC code that is associated with the linked Opportunity or Award. Also shown here will be the federal contracting Vehicle, if a Vehicle has been linked to the Pursuit. In the Likely Bidders tab, GovTribe displays for you the list of companies (in the context of their most relevant past performance) that you are likely to be bidding against for that Pursuit. We generate this list using data mining techniques based on the information you have linked to the Pursuit. We use the linked Opportunities and Awards to identify the category of work, the set-aside, the agency buyer, and any past vendors. We also use all associated text - the Opportunity title and description, the scope of services - to semantically understand the content of the Pursuit. Based on this data, we generate a list of relevant past performance that is then rolled up by Vendor to show you your likely bidders (or possible teaming partners, if your interest is as a sub-contractor).